Create more uniform, professional-looking pallets with the Wulftec WRING-500. This industrial-grade machine locks loads in place to eliminate shifts and slips. This helps to ensure the structural integrity of your products while preventing against damage or loss. 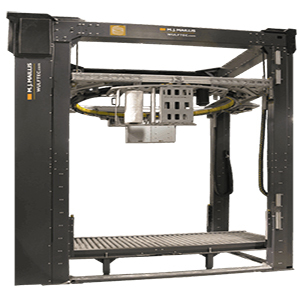 Not only is this the perfect stretch wrap solution for the improved stability of your light or unstable pallet loads, it can also help streamline your packaging line efficiency. The WRING-500 wraps up to 120 loads per hour and offers unmatched safety and durability. To learn more about the Wulftec WRING-500 Conveyorized Automatic Ring Stretch Wrapper, give us a call at (609) 337-3641 or request a quote online. Hughes Enterprises offers 24/7 maintenance, installation and repair services from factory certified technicians. Give us a call whenever downtime strikes, and we’ll be there to offer the on-site support you need. It’s part of our unmatched customer service guarantee.